The HeadsUp System sets up in seconds and is always watching. When you return home with gear on the roof of your car, the system provides a visual and audio alert - reminding you to STOP and unload your gear. From our Bicycling Magazine review: "Setup is simple...it's a lot cheaper than replacing a bike or fixing your garage. And not losing ride time while your frame is repaired is priceless." How It Works: When you return home with your vehicle and your gear, the LED sign in the garage flashes and the InCar Alerter beeps - reminding you STOP and unload your gear. See it in action (video). 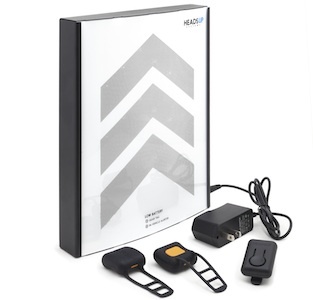 What’s Included: The system includes an LED alert sign that mounts in your garage, tiny wireless tags that go on your gear, and a wireless alerter you place in your vehicle. Bicycling Magazine "Gear of the Day"
the 'set and forget' nature of the product."